The Oakland Business and Professional Women's Club was started March 16, 1917 with a meeting at the Hotel Oakland. It was intended to be "an organization that would bring camaraderie to business women." 1 Gladys Barndollar, Alice Burnell and Helen Powers headed the organization. Gladys Barndollar had previously headed the women's bureau of the Chamber of Commerce. The bureau started an "Oakland Label" program to encourage products made in Oakland to be promoted so that money would come back to Oakland, not unlike today's Oakland Grown program. Barndollar later served as the fourth president on the club. Alice Burnell was the first president of the Women's Club. She was also the first female court reporter, appointed in 1919 in the Alameda County Superior Court. The club produced The Business Womens Herald - Official Publication of the Business and Professional Women's Club. After several years, the club outgrew its home at the hotel, and they raised money and built a clubhouse in 1924 at 1550 Webster. 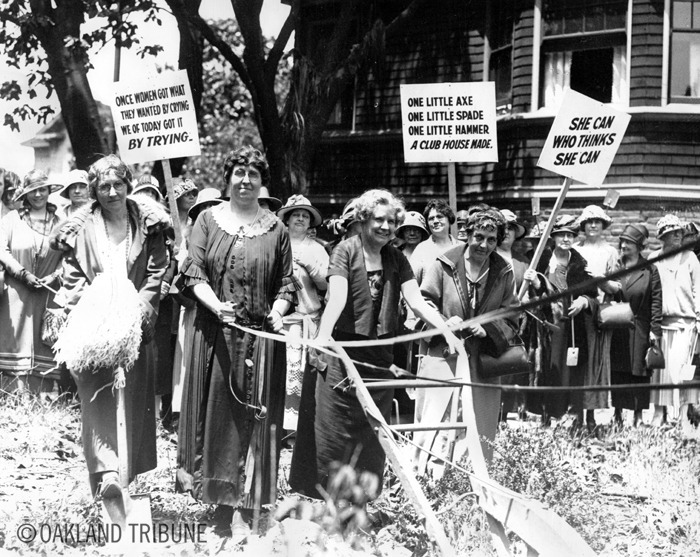 "On July 14, 1924, a parade of business women carrying shovels and banners—some reading 'Once women got what they wanted by crying, we of today got it by trying'—marched through Oakland's business district." 1 The architects were Chester Miller and Carl Warnecke.